Recognized as an industry leader for over 30 years, Omega Design Corporation manufactures a broad range of high-quality container handling and packaging equipment systems. The list of equipment produced by the Exton, Pennsylvania-based Company is impressive: plastic bottle unscramblers, puck unscramblers with container placement, shrink bundlers, stretchbanders, tray shrink packaging systems, wrap-around case packers, secondary orienters, canister desiccant feeders, and specialty equipment. The wide range of markets served by the Omega equipment is equally noteworthy, with installations in the pharmaceutical, personal healthcare, cosmetic, food, beverage, dairy and chemical industries, to name a few. One of the company’s flagship products, the “Classic” Series of Shrink Bundlers, has gained a particularly stellar reputation. Hundreds of units have been sold and are in operation throughout the world. This pneumatically-driven, PLC-controlled machine was designed for automatic shrink or stretch packaging of glass, plastic or metal containers, boxes or cartons into pre-determined bundle configurations. The design of the “Classic” series helps to eliminate the high cost of cardboard boxes and creates a more efficient, secure package, which lends itself to further automation down the line, such as case packing. 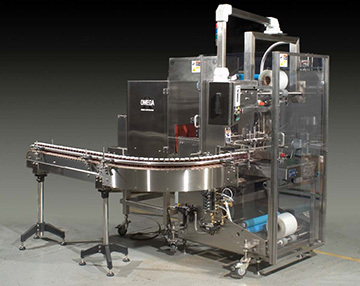 In the spirit of constant improvement, Omega sought to enhance the performance of the “Classic Shrinkbundlers.” After incorporating several other machine upgrades - resulting in a 50% increase in output - the company focused on the product pusher, a pneumatic-driven actuator that literally “pushed” the product into the film or other packaging material. Inherent in this pneumatic driven actuator was excess play and uneven motion control, resulting in increased setup time and maintenance. But that was just the tip of the proverbial iceberg. With many of Omega’s customers increasing their demands for unique packaging, the company needed to accommodate an increase in alternative package designs, sizes, materials and configurations. This was proving to be a difficult proposition with Omega’s current pneumatic system, because the uneven motion control produced inconsistent product flow through the pusher area, and could cause the products to become misaligned, creating a machine stoppage. Stoppages result in downtime, which translates to a loss of profits. “Frequent changeovers on a packaging line often require you to stop production for re-tooling, sometimes taking up to several hours. We needed an intelligent yet cost-effective solution that could handle a variety of packages,” said Devendra “Win” Shendge, a Product Development Specialist with Omega Design. Omega needed an actuator that would produce higher speeds, yet would have “intelligent” motion control capabilities to accommodate a broad spectrum of product dimensions. They also needed a solution that would require little or no maintenance and one that would greatly reduce the use of costly air, as well as the occurrence of air leaks. In a quest for a new solution, Omega engineers contacted numerous suppliers and scanned the design trade magazines before coming upon an advertisement for Kerk Motion Products, a leading manufacturer of non-ball lead screws. After discussions with applications engineers and a thorough examination of the company’s offerings, Omega saw tremendous promise in the Kerk RGS™ (Rapid Guide Screw) 10000, a new screw-driven slide that offers exceptional linear speed, accurate positioning, and long life in a compact, value-priced assembly. The length and speed of the Kerk RGS is not limited by critical screw speed, allowing high RPM and linear speeds, even over long spans. Standard leads include .100", .200", .500" and 1.00" travel per revolution. With Kerk’s wide range of available leads, speeds over 60 inches per second (1.5 meters per second) are possible, rivaling belts and cables while offering superior positioning accuracy, repeatability and axial stiffness. The Kerk RGS includes a precision aluminum guide and carriage and is driven by a precision rolled stainless steel lead screw. The moving surfaces include Kerkite® high performance polymers running on Kerkote™ TFE coating. It has a unique, compact profile that provides exceptional torsional stiffness and stability for its size and weight. The integral mounting base allows support over the entire length if desired. The Kerk RGS 10000 also comes standard with a wear-compensating, anti-backlash driven carriage. Using Kerk’s RGS 10000, Omega Design has succeeded in producing a new machine with benefits for both Omega and their customers. The new bundler demands less maintenance and requires less labor to maintain. Omega has also realized significant cost savings, as less labor is needed to assemble the machine, and has reduced the number of components. No longer will Omega or its customers need to stock various sensors and pneumatic parts, which have now been replaced by the intelligent actuator. Shendge also said that in the original testing, the RGS 10000 was generating 150 pounds of force, while the original air cylinder only produced 80 pounds. Omega first purchased an RGS 6000, but it was too small to do the job. Omega asked Kerk for a bigger unit; one did not exist at that time, Kerk explained, but they were in the process of tooling up for the RGS 10000. Omega wasn’t the only company impressed with the results. Shendge also indicated that Omega has received a number of requests for RGS 10000 upgrades to existing bundlers. In fact, he said that Omega has provided several quotes for upgrades from the trade show inquiries alone, where the RGS 10000 was introduced. Multiple upgrade installations for existing users are planned in the near future. “We’re still in the evaluation phase, but I suspect that the RGS 10000 will be standard for the Classic SL-18.” Upgrades to Omega machinery do not stop at the bundler’s “pusher” unit. Kerk is currently designing a new actuator that features a round shaft. According to Shendge, Omega is considering the use of these new actuators to replace the remainder of the pneumatic cylinders on the machine. “We look forward to continuing our relationship with Kerk, and incorporating additional intelligent motion control solutions into our equipment,” said Shendge.